We are a simple family with imperfections, yet are blessed by God in countless ways. Although the kids sometimes quarrel, there are many sweet moments between them. 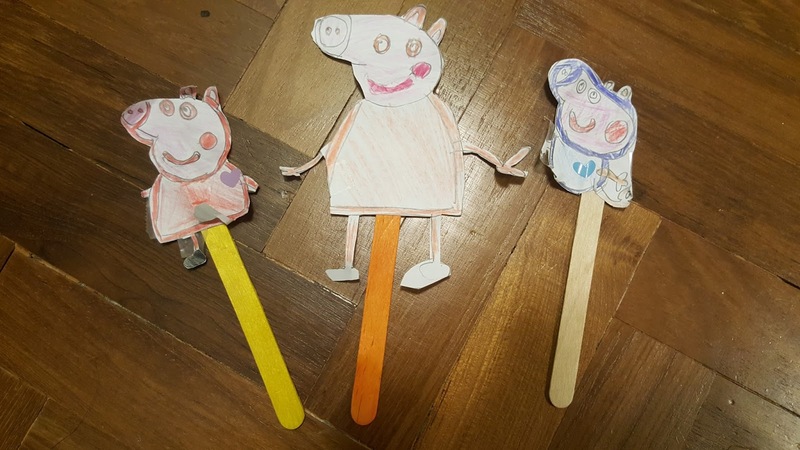 Little An has been asking me to make puppets of the Peppa Pig family but I kept citing 'no time' as an excuse. Guess who eventually made the puppets for her? 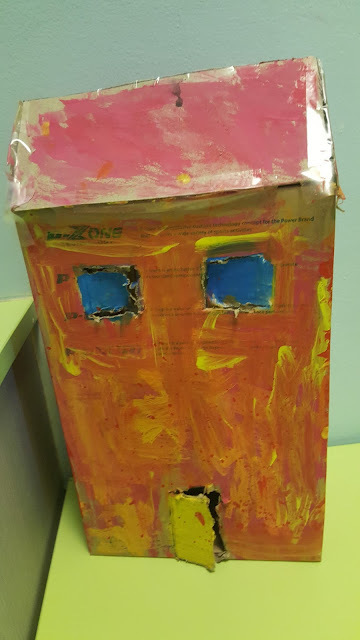 Sweet J not only made the puppets, he even built a house for the Pig family! He organised a painting session for his friend and sister and together, they completed the house. The sweetness does not stop here. J has been saving money to buy the expansion pack of a game he enjoys. 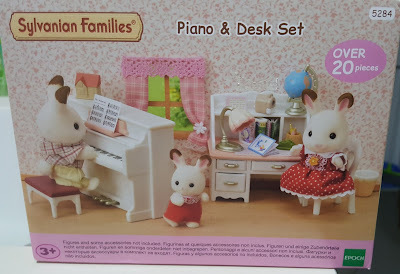 When he got to spend the money at the end of Term 1, he bought a gift for his sister too. It was a Sylvanian Families' piano and desk set, which Little An absolutely loves. During our Japan trip last year, J was given some money to spend. He mostly bought gifts for his sister and other members of the family with the money he was given. Bless his kind heart! J also assigns work to his sister and marks it for her! Little An adores her brother and considers him her favourite person! May God continue to let love be shared between them. My family has just spent three days and two nights in Yilan county and I was grateful for the escape from the hustle and bustle of city life. I chose a minsu in a remote area in Dongshan and although we needed a driver to get to all our destinations, I loved my choice! When we were in Yilan, the sun was scorching in the day and the temperature went up to 34 degrees. The children were most delighted when we arrived at our minsu in the evenings. They had reason to celebrate as the minsu owners had decorated the rooms to attract young clientele like them. Our room on the first night had a swing with a teddy bear and lots of toys. The bath tub overlooked the paddy field and both children took turns to soak in it. There was also a mini kitchen for little chefs and Little An went on the slide with Lightning McQueen many many times. On Day 4, we had a relaxing morning before proceeding to Lotte World. We chose Lotte World over Everland as it had an indoor section, which would be able to withstand any weather. When we arrived at Lotte World, it was already 12.30p.m. My enthusiastic daughter opted to go on rides before lunch, and by lunch time, we had gone on five different rides, with a repeat on one of the rides. The rides were Drunken Basket, Jumping Fish (Little An's favourite), Dragons Wild Shooting, Lotty Train and Eureka, which required us to pump on a piston in order to fly. The final location included in our day tour was Gangchon Rail Park. I spent quite a lot of time researching on this place as I wanted to be sure it was safe for kids and that it was not too strenuous for me. I also read reviews that it might not be suitable in cold weather. I finally decided to go to the rail park when my friend said she and her daughter could accompany us. On the day itself, however, her daughter fell asleep and my friend opted out. Little An and I were left to operate a four-person bike on our own! Little An tried to stretch her legs out as much as she could to help, but she told me in disappointment that her feet could not reach the pedals. I was appreciative that she was so sweet. My last trip to Korea was in June 2007 and we had joined a tour group. This time, I was audacious enough to lug my five-year-old on a free and easy trip there in the cold month of March, knowing only two Korean words. Before the trip, I was gaping at the temperature charts (which showed that the temperature would range between -2 and 12°c during our trip), wishing that the country would heat up while we were there. I also added to the sales figures of Uniqlo by stocking up on its Heat tech products. All my worries were unfounded. Our outer jackets (mine was a lightly padded one from Uniqlo while hers was a little more puffy one from Decathlon) managed to keep us warm throughout the trip. On most days, we wore three layers (extra warm Heat tech thermals, a shirt or jumper and our jackets) and we were comfortable. Our final day in Taiwan was reserved for DIY activities, shopping and a hot spring experience. We had asked the taxi driver who took us to Leofoo if he could be our driver for this day as he seemed honest and his charges were reasonable (NT3200 for 8 hours and NT500 for every additional hour) and were glad that he was available.